What's the Opposite of Loudly? myan2-myan2 thwa3 means "go fast". pfyay3 pfyay3 thwa3 means "go slow". In Burmese kjeare2-kjeare2 means loudly. And the opposite of kjeare2-kjeare2 is toe3-toe3. I am lost for word as to how to say the opposite of "loudly" in English. Is there an English adverb which means "in low volume"? "Quietly" or "Silently" means no volume at all. You can say "whisper", "hush..hush" or speak "softly", but how do I tell someone to listen to the radio in low volume using the opposite of "loudly"? In Burmese you don't indirectly say: "Please turn down your volume" because you can directly say: "Please listen unloudly." I have never heard of the word "unloudly" in English before. Have you? And I have never heard of anyone saying "Please listen softly" either. Could it be that there is no English word for toe3-toe3 because English speakers always turn up the speakers and never play their music toe3-toe3 ? By the way, the Burmese phrase is toe3-toe3 pfwin1 (in low volume + to open) to tell the teenager to turn on the latest electronic gadget in low volume. CLICK TABLE HEADER COLUMNS TO SORT BY ASCENDING OR DESCENDING ORDER IN ENGLISH OR BURMESE. Imagine yourself driving a red Ferrari down the long and winding mountain road. Suddenly, at the steep corner turn, you lost control, and you find yourself in the clouds. You quickly press the emergency button with your shaken hand, and the parachute opens. As you take a deep breath, you see the blue mountain behind the clouds in your rear-view mirror. You will now never forget the meaning of MOUN3, (to drive) on the MOUNtain road. That's a memory technique where you are learning to associate the word MOUN3 with MOUNtain. Here is a video clip with less power than a red Ferrari. xxxx chin2 deare2 -- I want to xxxx. thun2-yone3 thwa3 chin2 deare2 -- I want to go to the embassy. moun3 ba2 -- Please drive! You still find the sentence unsatisfactory because you have expressed only half of what you really want to say: You are in a hurry. You want him to drive fast. thun2-yone3 a-myan2 thwa3 chin2 deare2 -- I want to go to the embassy fast. 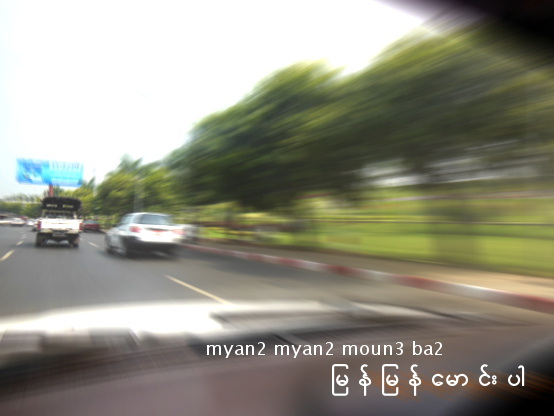 myan2-myan2 moun3 ba2 -- Please drive fast! 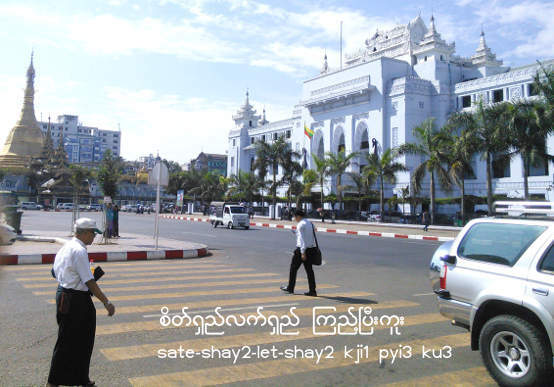 The Adverb in the Burmese grammar has a Pali origin, and is known as kri1-ya2 wi1-thay2-tha1-na1. The word kri1-ya2 refers to the action words (Verbs), and wi1-thay2-tha1-na1 means to modify or to qualify. Burmese adverbs qualify the verbs similar to English. yo2-yo2 thay2-thay2 kine2 ba2 - Please handle with care. mo3 a-kji3-a-kjeare2 ywa2 nay2 deare2 - Rain is pouring down heavily. teare3-boat dway2 pfa1-yo2 pfa1-yeare3 pfyit kone2 byi2 - Huts are in disarray. a-khu1 thwa3 -- Go now! Note that this adverb time word a-khu1 meaning "now" will be a noun a-khu1 if used with the descriptive adjective word such as "sunny" or "raining". a-khu1 thwa3 dau1 meare2 - I am about to go now. kha1-nah1 nay2 sa3 ja1 meare2 - We shall eat in a while. beare2-lo2 thwa3 ma1 leare3 -- How will you go? beare2-dau1 thwa3 ma1 leare3 -- When will you go? lone3-wah1 tha1-bau3-ma1-tu2 bu3 - I absolutely disagree. a-neare3-ngeare2 dtha2 hteare1 - Just put a little. The song in the video clip below used the adverb da1-jain2-ta1-kha2 meaning once in a while. dthau3 -- (particle) convert the clause into adjective to mean "rare"
da1-jain2-ta1-kha2 dtha2 yah1 dthau3 pweare3-dau2 a-tu2-tu2 pyau2 -- We have this festival only once in a while. Let's be happy together. Now, we will add adverbs to the verbs we have met in the previous lesson. The following are mixtures of complete sentences, verbal commands, suggestions and phrases. They are organized in the same sequence as in lesson 7. You will note that many of those Burmese adverbs are formed by doubling of words. For example, koun3 means good (adjective), and koun3-koun3 means nicely (adverb), or in a good manner. Those double-word adverbs are frequently used in spoken form and they are further classified as hna1-kjain2-htut kri1-ya2- wi1-thay2-tha1-na1 in Burmese grammar, which means "two-times-repeat adverbs". thate ku2 chin2 ta2 beare3 - -- I want to help so much. nay2 -- particle equivalent to present participle "ing"
lu2-dway2 ayan3 toe3 nay2 ja1 deare2 -- There's too much shoving and pushing going on. In Burmese, the word thout (to drink) is used for "taking" medicine in both liquid and tablet forms. ma1-net tine3 a-loat sau3-sau3 thwa3 deare2- - [he, she, I] go(es) to work early every morning. but-sa1-ka3 a-kja2-ji3 soun1 nay2-yah1 deare2 -- I had to wait for the bus for a long time. a-chain2 thate ma1 pfyone3 ba2 neare1 -- Don't waste too much time! This word is interesting. ma1-kja2 kha1-nah1 is a coined word using ma1-kja2, which means not + take a long time, and kha1-nah1 kha1-nah1, which means again and again. So, ma1-kja2 kha1-nah1 means you do something again and again before a long time. The appropriate English translation is every now and then. ain2 chau3-chau3 moon2 moon2 pyan2-yout-la2 byi2 -- [ He, she, I] has/have come back home safely! pfa1-nut go2 de2 hma2 thut-thut-yut-yut choot ba2 -- Please remove your shoes neatly here. hin3 dway2 pfyit-ga1-dut-hsun3 ma1 chet ba2 neare1 -- Please don't anyhow cook the dishes. ba1-gun2 sin2 oun2 thay2-thay2-cha2-cha2 hsay3 -- Thoroughly wash the dishes. ma1 leare3 -- ending question word. yay2 lone2 oun2 beare2-lo2 pate ma1 leare3 -- How do I shut the faucet tight so that water will not be dripping? The word oun2 is a positive word which means "to pass", such as in "to pass the exam" (verb). It can be appended to several other words as conjunction to mean "in order to make it happen". For example, sin2 oun2 means "in order to make it clean", where sin2 means "be spotlessly clean". yay2-di2-yo2 a-kjeare2 ji3 na3-htoun2 -- listen to the radio so loudly. Note that in Burmese, the above sentence is not a negative imperative, but a positive suggestion. Take note of the omission of "you" and "I" in the above Burmese phrases. They are implicitly implied and unnecessary in such phrases. a-pup-tine3 hmun2-hmun2 zay3 weare2 deare2 -- I shop regularly every week. Myanmar housewives probably shop for dry goods every week. Majority of households in Myanmar buy fresh vegetables and small portions of meat, fish, or chicken almost every day in the neighborhood market. There are also sellers -- usually women-- going around some neighborhood every morning, each carrying a big basket of grocery items on their heads and crying out the melody of their signature voices. Adverbs should be studied after the verbs. In Burmese language grammar, particles and postpositional markers are also important because verbs or adverbs alone will not work. Those parts of speech will be discussed later in detail.